Before I get down to the business of listing digital newspaper collections by state, there are some preliminary issues that need to be covered. In my first installment of this series, The Introduction, I pointed out that present copyright law provides for copyright protection for a period much longer than the life expectancy of the newspaper media, i.e. the paper it is printed on. This issue raises some interesting questions about both newspaper preservation and copyright law as it exists in the Unites States. Before some of the other countries start feeling smug, I might point out that some countries have extended their copyright protection for much longer periods than the U.S.
Genealogists, from my experience, routinely copy obituaries and other newspaper content without a second thought. If I were to go online in any of the major online digital newspaper archive programs, I would find an obituary for one of my ancestors who died within the past 30 years or so without too much trouble. I could then easily either download the image of the newspaper or capture it with a screen capture program and add the entire obituary to my ancestor's file as a source. Going back thirty years gets into the gray area of copyright law, when documents such as newspapers may or may not be subject to copyright. In addition, being able to determine if the copyright law applies and then determine who owns the copyright may be almost impossible. Let's say a work was published in 1984. U.S. Copyright law uses the term "work" to clearly apply to anything with copyright protection including a newspaper article such as an obituary. Under the existing U.S. law in Title 17 of the United States Code, A work published in that year with a copyright notice would be protected for 70 years after the death of author. But if the work was of corporate authorship, protection would last for 95 years from publication or for 120 years from the creation of the work, whichever expires first. OK, now newspapers can become brittle and even unusable in about 30 years. See "The Deterioration and Preservation of Paper: Some Essential Facts." from the Library of Congress. Hence the issue. But wait a minute, are newspapers covered by copyright? Under the current definition of a "work," they certainly are as collective works. For a more detailed explanation see my previous post entitled, "Old Newspapers and Copyright." You can also refer to the Pennsylvania Newspaper Handbook article on copyright from the Pennsylvania NewsMedia Association. So using digitized material from newspapers is no different than any other work covered by copyright law. But what about obituaries? Well, the author of the obituary may or may not retain his or her copyright. Retention of the copyright will be determined by the agreement made between the newspaper that printed the obituary and the author. In some cases, the author assigns all rights to the publication of the work to the publishing newspaper. Copying copyrighted works, including newspapers, involves the risk that the copyright holder will exercise his or her rights and sue you for copyright infringement. Is this something to worry about? But what about fair use? Fair use is a very slippery legal topic. The term "fair use" comes from legal cases decided by the U.S. Federal Courts and it is referred to as the "doctrine of fair use." What this boils down to is that whether or not a particular use comes within the doctrine has to be decided on a case by case basis. Fair use is essentially a defense to an infringement of copyright claim. Now the question of copying obituaries, copy right and fair use. I suggest reading Judy G. Russell's post entitled, "Copyright and the obit." Then I don't have to go through all the same issues. The list could go on and on, but let's just say there are legal issues and even if the entity conducting the digitization project has permission to use the images, there may still be copyright claims if the newspaper content falls within one of the time periods where coverage is offered by the particular copyright law in effect at the time. How is that for a weaselly legal answer? But until someone decides to sue, it will likely be business as usual in the genealogical community. Now, I will finally get to the list of online digital newspaper collections by state, but there is very likely to be a gap of a few pages since this particular article is being written from Canada and I am on my way off into the wilds of Alaska. Names and dates in genealogy have been vilified by some lately as somehow beneath the notice of real family historians. But let's face it, genealogy is basically made up of identifying people who are our ancestors. How do we do that without being focused on names, dates and places? We would all like to have elves come and do our work in the night like the fortunate shoemaker, but that seldom happens except in storybooks. The implication of the negative comments about names, dates and places is that somehow genealogical research can be accomplished by gathering family stories and memorabilia. The body of genealogy cannot function without its properly constituted skeleton of hard, cold facts about who the ancestors are, when and where they lived and proper documentation about each one of them. Adding the flesh to the bones only makes sense if the stories and photos and other important external details correspond to the right person. As it is, we are presently creating some horrible looking hybrid Frankenstein monsters in our online family trees that do not have a shred of evidence of documentation or even logic to support them. The first step in genealogy is and has been for a very long time to gather documentation about what you already know about your family. I talk to too many genealogists who enter names into pedigree charts and then transfer those names to an online family tree without even one source citation. You do not even enter yourself into a proper genealogy without source citations. Our ability to transfer data from one person to another using GEDCOM files and other files exchanges makes it appear that we can build a proper pedigree almost instantly. Add the fact that some online family tree programs constantly suggest links to potential ancestors in other family trees already online and you can build a huge amoeba of genealogical data without a single bone (verified fact) in its entire body. These online family trees are becoming a nightmare monster movie of the amoeba that ate the world. Basic, well-founded, well-considered, logical, accurate genealogy consists of building from the known to the unknown. It is not a process of see it, add it. We are collectively turning into the online bag ladies of genealogy, collecting every scrap of trash we can carry in our online family tree shopping carts. Knowledgeable, fact based, source dependent genealogists are being brushed aside as irrelevant to the process of adding piles of garbage online. In addition, the online programs have mechanized the process of adding individuals without allowing even a brief review of whether or not this document or this connection to an existing family tree have any connection to our own ancestor. Yes, the process is made more efficient, but in most cases it makes it harder for the rational, source based genealogist to control. My attitude here is to ignore the garbage that is ignore the daily suggestions I get from dozens of online sources that they have found a link or a record for my family. They do not determine what I research and what I add to my family tree, I do. Consider this basic question. What documentation do you have that you were born? OK, other than the obvious fact that you are alive and reading this post, have you really taken the time to document your own birth? Now I am back to the questions I referred to above. Many people look at me as if I am talking nonsense when I suggest that they begin by documenting themselves and their immediate family. But think about it. What if each of your ancestors had carefully documented and recorded their own life? Wouldn't we be out of work? Do we really want to pass the job of documenting our own lives off to our descendants, just as our own ancestors did to us? Isn't the basic function of genealogy to stop this needless repetition of research and build an accurate family tree? Today's genealogy is apparently all about numbers. The first question I am frequently asked when I tell people about my interest in genealogy is how far back I have traced my ancestry and how many names do I have in my database. Really! That is so out of touch with the basic idea of genealogy. I usually brush those questions aside. This reminds me of one researcher I talked to for quite a while who was convinced he was related to one of the passengers on the Mayflower or whatever and had traced the descendants down from the passenger and just lacked that last person connecting his family to that descendancy line. As far as I know, he is still searching. 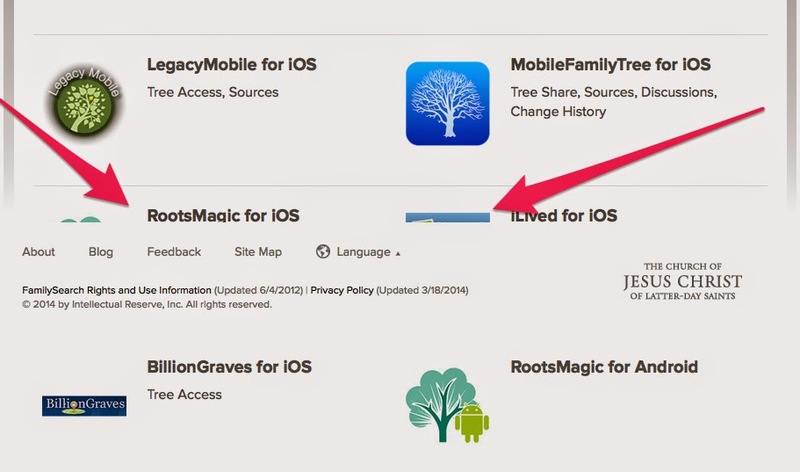 We seem to want "Instant Genealogist" in box. Something that can turn anyone from teenager to adult into a competent family historian in a one hour television show. Well, the same issue has been answered in the old joke about how you get to Carnegie Hall. You do this by practice, practice and more practice. I get criticized because I tell people genealogy takes time, work and effort. I am accused of being politically incorrect because I claim that genealogy is difficult and some people simply do not have the skills to do the work. I am accused of being an elitist and discriminatory because I advocate accuracy and knowledgeable research rather than trash. Worse than all that, I am branded a "genealogist" rather than the politically acceptable "family historian" because I would like to make sure I am researching the correct ancestor and identifying people correctly in photographs. Perhaps it is time to push back and stand our ground. Sloppy, inaccurate, poorly documented family trees are not acceptable. There is no excuse for blind copying of family trees. Facilitating this poor excuse for research and calling it genealogy is demeaning to what I do and what any well-founded and sincere genealogist is attempting to do. Let's get back to the basics of genealogy. Shipley’s vision for IAJGS includes continued state-of-the-art technological support for conferences with Internet streaming provided by FamilySearch and strong Jewish Genealogical Societies worldwide. Shipley will lead development of an IAJGS “society-in-a-box” as well as a “conference-in-a-box” for member societies to use to grow their membership base. He has prior experience implementing the “conference-in-a-box” capability through the 800 remote RootsTech conferences he supported and helped organize. The “society-in-a-box” would take advantage of best practices he observed working closely with over 500 societies in the 1940 US Census indexing effort where 170,000 new indexers were recruited and managed to index and arbitrate the entire collection in only three months. Shipley is a member of the Utah Jewish Genealogical Society. He and his sister have had great success in using synagogue records in Germany to discover their Jewish ancestors. The International Association of Jewish Genealogical Societies (IAJGS) is an umbrella organization of 74 Jewish genealogical organizations worldwide. The IAJGS serves the shared needs of its members, coordinates and organizes activities such as the annual IAJGS International Conference on Jewish Genealogy, and provides a unified voice and acts as the spokesperson on behalf of its members. The IAJGS’s vision is of a worldwide network of Jewish genealogical research organizations and partners working together as one coherent, effective and respected community – enabling people to succeed in researching Jewish ancestry and heritage. Find us at www.iajgs.org , like us on Facebook at http://www.facebook.com/iajgsjewishgenealogy, and follow us atwww.twitter.com/iajgsconf . For Genealogists, Are There Excuses for Computer Illiteracy? Do you first ask who has home internet access? Who has broadband access? Without broadband, YouTube is inaccessible. Remember the Nauvoo people. There's a lot of genealogical information online, it's true, and being familiar with online tools can make a genealogist's life easier, but not everyone is going to be able to make the jump into the online world. Although I'm middle-aged, I've been working with computers in one form or another since I was a teenager; I swim these seas, but those of us who were introduced later in life, or who don't have regular access (a computer in their home, connected to the internet), may struggle to stay afloat. For someone who's my age, or older, the mental gymnastics required to learn to use a computer well are sometimes (not always, but sometimes) more limiting than we realize. So, please, go easy on people who aren't in the know about things. We all must face obstacles in our genealogy paths, but we certainly don't deserve to be criticized for having trouble when we find the path steeper than we can manage. So am I being critical of people because of their physical and other limitations, such as lack of a high speed Internet connection? I guess what I see here is a reflection of the ongoing process of technological change. When I was very young, we had a crank telephone on a shared party line answered by a human operator sitting in an office facing the main street of town. If I was looking for my father or mother, I could call and ask her if she had seen them pass by. We also had a wood burning stove. I watched my neighbors install indoor plumbing for the first time. I think I can say a little bit about the impact of technology. But there is a deeper issue here. Using a computer takes a special set of skills. I can also relate to those who have physical limitations, I am partially deaf, cannot see as well as I once could and have joints that don't work so well either. In other words, I am a certified member of those of us experiencing being "later in life." One skill I acquired early in life was how to type. That particular skill has been one of the few lasting benefits I gained from going to high school. I certainly realize that not everyone has the same level of skills, for typing or whatever, that make it easier to acquire computer knowledge. What I do see constantly is an attitude that rejects the technology that is very prevalent among older genealogists. Our society has come a long way in accommodating those with physical or other disabilities. But we have a lot longer way to go. The real question, however, for the individual is whether we use those physical and mental limitations as an excuse or a challenge to overcome. My comments are aimed that those in the genealogical community who do not try to overcome their limitations or even worse use them as an excuse and simply ignore the new technology. I spend the bulk of my time helping older people with genealogy. I do not criticize anyone for their limitations. I am willing to patiently help anyone who is willing to learn. I do not think that having a negative attitude about technological change and rejecting obvious advantages is something that should be overlooked or excused. I recognize my own physical and mental limitations and try to work around them. The commentator describes people who are trying to overcome disabilities, not people who are not particularly limited but reject technology out of some other motivation. If I am out hiking around in a national park, I often come to signs that say that a path will not accommodate those in wheelchairs or otherwise disabled. Some would use that notice as an excuse, others would see that notice as a challenge. Genealogy doesn't come labeled with such notices, but maybe it should. Parts of genealogy are difficult for everyone, no matter what our status in life. But that should be viewed as a challenge, not as an excuse. Are MyHeritage's Records Limited to Genealogical Beginners? As for MyHeritage.com, for the U.S. it has little for before the 20th century, and pre-20th-century material is largely (or completely?) available elsewhere. Much depends on where a researcher is in her/his research. I must say immediately, that I heartily disagree with the comment's conclusions. I cannot imagine this comment coming from someone who has used the MyHeritage.com program the way it is designed to be used. I am not even sure what the commentator is talking about. MyHeritage.com is primarily a family tree hosting program with extensive family/social networking capabilities. Its automated research capabilities are based on its programmed Smart Match, Record Match, and Record Detective Technology and fully functional only when the user (member) has a full subscription to the program and has uploaded or entered a family tree. Using this technology, the program begins to search for connections with other users' family trees and matches the individual ancestors who are the same person. This technology is very accurate in establishing relationships and we have had some remarkable experiences in connecting families. The Record Matching and Record Detective technologies are equally amazing. They are extremely accurate in identifying pertinent source records which can then be easily attached as sources to an individual or family. If the commentator did not follow this procedure, then it may be understandable as to why the comment was made. If you simply use MyHeritage.com to search for individual ancestors, your efforts will be no better than your own ability to search and usually about the same as any other online genealogical database. I can see how some people may be disappointed in the results of their own searches. If you want to research an individual, you need to do that from within your uploaded family tree. You will find the records much more pertinent if you search from ancestors that already have attached sources. Now to the complaint about the content. No one is very impressed with a database that does not seem to have the record you are searching for. That is the same criticism that can be made about any or all of the online genealogical database programs. But the comment about the limitations of the records to the 20th Century are what indicates to me that this person did not use the program as it is intended to be used. Many of the U.S. records found by MyHeritage.com for the ancestors in my family tree date back into the early 1800s or much earlier in the U.S. The U.K. records go back to the 1500s. Danish and other Scandinavian records go back to the 1600s. Very early U.S. records have generally yet to be indexed and therefore they are not usually available to search engines. I have been waiting for Town Records from New England to appear online and I am still waiting. This is not at all a limitation of MyHeritage.com. As they acquire newly indexed databases, those records become quickly integrated into the superior search capabilities of the program. What about the availability of the records elsewhere? That is an interesting criticism. I guess my response to that is so what? Do you want the help of the MyHeritage.com search capabilities? I certainly do and the fact that some of the records are in other online programs is meaningless in that context. 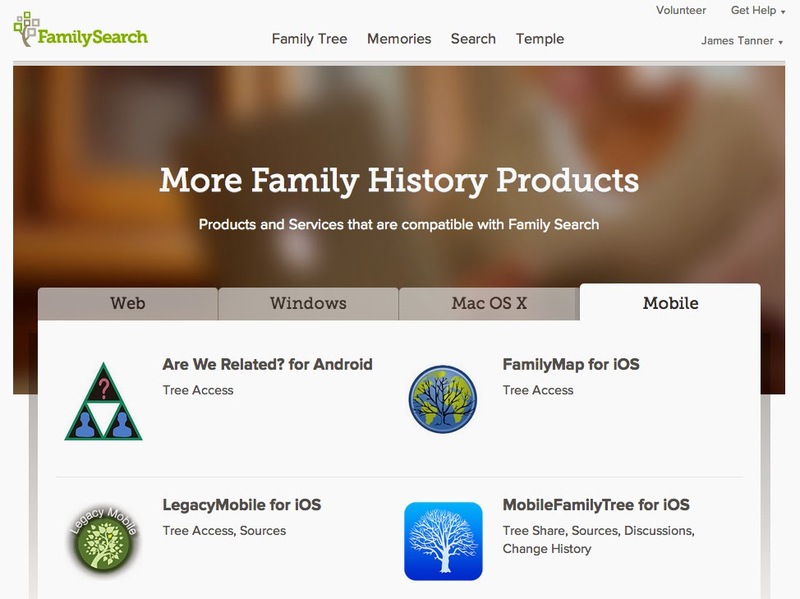 In fact, many of the newly added records come directly from FamilySearch.org which is just now beginning an automatic search program of its own. As for me, I am grateful the program does its automatic searching of records I would not have time to search on my own. Many of the same records are in all four of the larger online database programs, but each also has its own valuable records. The fact that any one or all of the programs do not yet have the records you are searching for has no bearing on the value of the programs. It is also entirely unfair to dismiss a program as only useful for "beginners" when the program may have records that you may never find now that you have that attitude. One of my opinions is that MyHeritage.com is not used enough by older, more experienced genealogists just because they do not understand how it works and are unwilling to put their family tree online in "another database program." They then lose out on an extremely valuable program. Newspapers are one of the most crucial type of genealogically important records, but they are also one of the types of records most likely to be lost. By their nature, newspapers were printed on cheap, highly acidic paper that begins to deteriorate almost immediately. In Arizona, we received a lot of local newspapers delivered free to our driveway. If we did not retrieve them quickly, in a matter of hours in the Arizona sun, they already had begun to turn yellow because of the chemicals used to produce the paper. Even if carefully preserved, newsprint becomes brittle and yellow with age. Because many newspaper repositories around the world recognize the temporary nature of newsprint, there have been massive efforts to preserve the existing paper copies for some time now. Many countries around the world have already begun the process of preserving their "newspaper heritage" through digitization projects. Making a legible copy of a newspaper page obviously requires specialized (read expensive) equipment and handling the brittle pages is also a concern. In the United States, the digitization efforts have taken an interesting turn. Many older newspapers were initially preserved through microfilm copies, so additional specialized equipment is needed to make digitized copies of the already photographed roles of microfilm. Initially, commercial enterprises began the process of microfiliming copies of newspapers and providing the microfilmed records to libraries and other repositories. Some of these same companies have now digitized these records and provided them online. For this reason, some of the larger digital collections are private, commercially operated companies. There is another very important issue in the digitization effort. That is the existence of copyright claims. Here is one area where copyright acts as a extreme hinderance to preservation. The tremendous length of copyright protection exceeds the life expectancy of the media. In other words, the newspapers will disappear before the copyright to their content expires. This presents a legal nightmare for the prospective digitization projects. In addition, many newspapers were published for only a short period of time and further, the companies or individuals publishing the newspaper are long since dead or defunct. These and other factors make overcoming the obstacles imperative and dramatically point out the inadequacies of some of our social and legal structures. There are quite a few national efforts in the United States to make digital copies of the newspapers available online. Most of these are subscription only services and in some cases, it is difficult to determine the exact coverage of their collections. Since some newspapers were published for only a short time or the publishing companies were sold or went out of business, determining which copies are available and where they are located is a problem. Small local libraries or historical societies may have the only existing copies of some newspapers. In some cases, these local collections have been consolidated in state libraries and historical societies. There are also likely some valuable collections in private collections. Presently, new digitization projects are announced regularly. Newspapers are an extremely valuable source of information for genealogists. Much of the history of our ancestors in America can only be found by reading the newspapers of their time. By their nature, most historians and genealogists included, have viewed newspapers as "secondary" sources. Even today, newspaper reporting is maligned as inaccurate and sensational. Those criticisms are well deserved. But in many cases vital information about our ancestors may only have preserved in the local or national newspapers. No reasonably exhaustive search is complete without searching newspaper archives. I am aware of only one attempt that has been made to list all of the newspapers in the United States ever published in one database. This is the US Newspaper Directory - 1690 - Present on the Library of Congress website. It is interesting that I find this resource seldom mentioned or used by genealogists. The Library of Congress has listed virtually every newspaper known to exist in a public collection. The list is limited by the lack of adequate such lists available from commercial online websites however. In some cases the copies of newspapers listed in state and local repositories may also be available on one of the large national commercial websites. The limitation of the Library of Congress list is that it is overwhelming in most cases. Any search by state will produce hundreds of newspapers published over the time periods included in the directory. When I show this list to genealogical researchers for a specific county they are usually surprised and overwhelmed at the number of newspapers published and the effort it would take to try to locate and read them all. But this one fact alone indicates how much history of our ancestors is being ignored by the failure to comprehensively search existing sources. Another attempt at listing just the the online collections is available from Wikipedia. The article is entitled Wikipedia:List of online newspaper archives. When I considered doing a list of such resources, similar to the list I did recently for Online Digital Map Collections by State, I thought seriously about whether such a list was necessary given the two lists I have so far referenced. Wouldn't any such list of digital newspapers just be a copy of what is already in the other two lists? However, both lists lack an explanation and overview. When I started the list of maps, my wife asked me why I didn't put out the list serially, state by state. At the time, I decided to go ahead and make an entire list even if it could be criticized as incomplete because I was unaware of any such list. Interestingly, both the Library of Congress list and the one on Wikipedia ignore the commercially available online archives. Some of the links in the Wikipedia article are to commercial websites, but neither list includes a list of those online repositories. What I finally decided to do was to create my own list, which I could then incorporate into the FamilySearch Research Wiki and include as many online sources as I could find. But to do this properly, I need the time to compile the list one or two states at a time. Once the project is complete, then I can publish the entire list in one post for an easy reference. So I begin. I am aware of only one attempt at compiling a significant number of digital newspaper images for free access. That is the Library of Congress's Chronicling America, Historic American Newspapers. At the time this post is being written, the Library of Congress had 7,705,905 digitized pages online. It appears to me that the collection grows at about the rate of 500,000 pages or so every six months. This list can be searched by every word in the newspapers. When I tell genealogists about this online source, they immediately ask whether or not that includes obituaries. I usually say, no, they cut them out before doing the digitization. Of course, the obituaries are included. Once again, however, it is important to understand the role that copyright plays in all of this effort to digitize content. Once the newspapers are imaged (digitized) this is only the first step in the process. Next, the content of the newspaper must be indexed. This is usually accomplished by using optical character recognition software (OCR). By its nature, OCR software is not perfect because the original copies may not be readable or the text may be missing. Mistakes in the original are also duplicated by accurate OCR. So any index to newspapers will be limited by the ability of the programs to read the text. As with any original document that has been indexed either by people or programs, it is important to view the original documents. This is one huge limitation of the commercially available newspaper collections. They usually have no convenient way to see the entire edition of the newspaper or read the papers as a whole from day to day. Their search engines often produce a single page from the newspaper with no apparent way of moving either to the previous page or to successive pages of the same edition. This makes the researcher entirely dependent on the indexes. OK, this is enough of an introduction. I will now have to look forward to getting down to work and producing the list. Stay tuned. Oh, by the way, this was started in the middle of my vacation so don't expect too much for a while. My next post will be on the effect of copyright on digital newspapers online. I think this is an important consideration and needs to be discussed before jumping into the whole subject of making a list of digital online content. Rather than being a simple case of using the word as it is commonly understood, this short list of words have become slippery when used to describe the content of these websites. For example, let's suppose that one of these websites digitizes and make available a copy of the 1880 U.S. Census. How is this counted? Is this one collection? Is it over a million images? Is it one record or a million plus records? If there are approximately 50 names per census sheet, can the website claim to have 50,000,000+ names in its database to search? (Assuming, of course, that the entire census has been indexed). The question is, what number goes into the overall claims made by the website to have millions of names or records. As I have said before, the size of the database is meaningless if it does not have the record you are looking for. Periodically, these online databases announce the addition of millions of more records. Recently, the numbers have gone into the billions. There comes a time when ever larger numbers become meaningless. No one can comprehend a billion names, much less multiples of a billion. Perhaps it is time for the large online database companies (without naming any names) to try to impress us in some other way. How about an emphasis on the accuracy of their searches or the ease of use of their programs. Both would be a somewhat refreshing change. I certainly realize that some of the companies do talk about subjects other than the size of the their database contents, but almost all large online companies enjoy telling us all how big they are and how big they will be tomorrow. I can remember when McDonald's kept a running count of the number of hamburgers served. Of course, as time went on, the numbers got astronomical. Finally, MacDonald's moved on to a more productive line of advertising. I also realize that the online large genealogy companies do use alternative methods of advertising, but nevertheless I still get regular blog post announcing another million+ records being added to this or that database. Some of these announcements are just trying to tell all of us about the newly added collections, but even that gets to be old news after a while. If you think about it for even a few seconds, you will realize that claiming to have added so-many names is meaningless. There could be more than a hundred names on any one page of some types of records. Likewise, a collection could contain 1 name on 1 record or a hundred million names on millions of records. The size is no guarantee of the relevance of the content. Let's consider a book for example. Is a surname book one record or collection? If so, do you add the total number of names mentioned in that collection to your statistics pertaining to the book? The term "record" is even more ambiguous. A record could contain millions of names or just one name. Likewise, a collection could contain millions of names or only one name. Isn't somewhat misleading to use the same term (i.e. collections) to refer to content involving millions of entries and therefor potentially many useful contacts with one that is merely a single individual? By the way, it is common for the larger companies to refer to a document with a single family name as a "collection." Presently, because the different companies use these simple terms in different ways, it is nearly impossible to compare the contents of the different database programs. How do you know if the records you are searching for are even in some of the online programs? Another post that answers the question, what has this got to do with genealogy? OK, I admit it. I can go on vacation, but I can't stop my mind from thinking all the time and words just keep bubbling out and getting written into blog posts. I wrote a post not too long ago about using YouTube for genealogical research entitled, "Why not start your research with YouTube?" OK, so now what has all this to do with genealogy? Well, YouTube is really big. Not just big, but gigantic. But guess what? This huge resource may as well be totally unknown and invisible to the vast majority of genealogists. Day after day, week after week, I teach classes and give presentations on genealogy. In almost every single class there are one or more people who express their inability to understand or use computers in any form. Do they understand how far from the mainstream they are? I spoke with a very nice lady recently who is the Director of a FamilySearch Center (Family History Center) and apparently has been for some considerable time. I asked her if any of her volunteers had gotten invitations to sign up with the three large database programs now being offered by FamilySearch. She had never heard of the program and it took her a few minutes to even understand what I was talking about. Her response was that might be nice for some people. Any reasonably exhaustive search today would, of necessity, require extensive computer use and ability. Why do I constantly find genealogists who have almost no concept of the information available online? For example, only a very small percentage of genealogists I have polled over the past few months had any knowledge of MyHeritage.com, one of the largest genealogy companies in the world with millions of unique records from all over the world. I get the same lack of response from questions about RootsTech, findmypast.com, most of the current genealogy programs and many other online issues. Even very experienced genealogists with adequate computer skills have no idea that YouTube might have genealogical content worth viewing. Once again, at this last conference in Parksville, British Columbia, I was asked what program might be a good place to move data from Personal Ancestral File. This particular person did not know the program had been discontinued and was no longer supported and did not know that the last changes to the program were made in 2002. He was also unaware of the existence of any of the programs I suggested. This has everything to do with YouTube. This online program is a pervasive part of our culture. It is an indicator on online interest. It reaches nearly every aspect of our lives in some way or another. Genealogists who put themselves outside of this online reality have really moved themselves, not just out of the mainstream of genealogy, but out of the mainstream of our world society as a whole. Back to a another statistic, over 92% of all of the people in the United States use a cell phone. In fact, there are now more cellphones in use in the United States than there are people. I would like to know who else is using them besides people? In fact, looking at the statistics, there are many countries of the world where cellphone usage exceeds the number of people living in the country and yet, there are still a considerable number of genealogists who do not have or use cellphones. I am not saying that we must all be glued to YouTube. What I am saying is that we need to realize that computers are not just another difficult thing to learn about. They are the main conduit for information, including genealogical information, today. This is not the future. This is the present and too many genealogists are living in the past along with their ancestors. What is amazing to me is that so many of these genealogists who profess to know nothing about computers and what is online keep coming to my classes and presentations. Lets look at a few numbers. In the past week or so, FamilySearch.org has added millions upon millions of images of original source records. The exact same thing could be said of each of the large online genealogical databases. Mocavo.com continues to add 1,000 databases every single day. Ancestry.com, findmypast.com, MyHeritage.com and many others add millions of records a day. The Digital Public Library of America has over 7 million online records and I could go on and on. What I find is that very few genealogists are familiar with most of these resources. At the conference this past weekend in Canada, I asked the question, yet once again, about knowledge and use of the major genealogical database programs. I was surprised that out of the almost 100 people in my class, that about 12 or 15 had heard of MyHeritage.com. Considerably more than is usually the case. This is an indicator to me that the genealogical community has not yet gotten the message. We should all know that Google has a huge collection of digitized books online. The entire collection, at least those books out of copyright, is entirely, freely accessible by anyone interested. Many other huge collection of digitized documents are also free. But, for genealogists, having free access to many valuable genealogical records is the exception rather than the rule. Many genealogical records are only available after paying a fee or a subscription cost. This dichotomy between fee and free is seen as a frustration for many genealogists. In addition, there does not seem to be any consistency as to which records or types of records are available free and which are not. A good example of this problem is the way birth and death certificates are handled by different states and even the same agency within the same state. So if I want a birth certificate from the State of Arizona for an ancestor back in the 1920s, I may be able to get a free copy of the certificate from the genealogy.az.gov website, but if I want a birth certificate, also from the 1920s, from say, Texas, I will likely have to pay to get a copy. This can happen within the same state. In Arizona, if the birth occurred after 1938, then you will have to apply and pay for a copy. Much of the justification for these charges is laid either to revenue enhancement or privacy. But if privacy is an issue with a record about a dead person, whose privacy are they trying to protect? It also seems strange that the issue of privacy goes away if I pay the proper fee. True, some states also limit who can even apply to receive the record, limiting access to "next of kin" or some other sometimes meaningless limitation. Genealogists compound this issue by exhibiting an attitude of "entitlement." Many genealogists seem to think that all online sources and all genealogy programs should be free and they are affronted when told that there is some fee or cost attached. These same genealogists don't seemed bothered when they have to pay to purchase a book or mail a letter. There is something about online sources and computer programs that seem to engender this feeling of entitlement. One genealogical area where this becomes more than an academic issue is the attitude governments have towards records. For example, England has a somewhat longer copyright protection term than the copyright protection term in the United States, in addition, unlike the United States, government documents are covered by copyright protection. For this reason and also for the reasons which I refer to as "revenue enhancement," England charges for copies of many records some going back into the 1800s. The United States government, on the other hand, has no "copyright" claims at all to their government documents, but still charges for copies and has layers of bureaucracy making it difficult to obtain records. In addition, the U.S. government has given commercial enterprises, such as Ancestry.com, access to digitize the records and then charge for access to those same government documents. In many cases, such as with the National Archives, a researcher can either go to the Archives and see the documents for "free" or pay for a subscription to Ancestry.com or one of the other sites with such documents. In some cases, it is interesting that the U.S. documents are both free and available through subscription. For example, FamilySearch.org has a complete set of the U.S. Census documents online for free, but Ancestry.com charges for access to the same documents. Admittedly, Ancestry.com has a more refined interface, but the documents themselves are the same. To make things even more interesting, FamilySearch.org offers free access to Ancestry.com and other subscription programs in its FamilySearch Centers around the world. Several other commercial online websites have complete copies of the U.S. Census records and there are other free copies online also, such as the set from 1790 to 1930 on Archive.org that is free. One factor that has affected this genealogical view of reality is that one of the first genealogical software programs, Personal Ancestral File, was distributed essentially for free. At one time, before the Internet developed to allow the program to be downloaded for free, the program cost $6.00. Many genealogist still use Personal Ancestral File for the simple reason that they would have to "purchase" a newer program. This is strange because many of the currently available commercial programs have perfectly adequate free versions, such as Ancestral Quest, Legacy Family Tree and RootsMagic. In addition, MyHeritage.com has a completely viable and very advanced genealogy program for free called Family Tree Builder. Again, there is no logic in what is going on. I could go on an on with examples of both free and fee websites and programs. Another aspect of this issue is the "overhead" of doing genealogical research that is not usually taken into account when this subject is discussed. I have used this example before, many times. If you were to have to travel to the National Archives in Washington D.C. (even if you lived in the surrounding area), you would have a pretty hefty expense for the trip. This cost would very likely exceed the cost of a number of online subscriptions. The fact that these commercial companies are willing to acquire and make available valuable source documents is really a tremendous benefit to the genealogists. In almost all cases, the cost of the subscription is far less than the real cost of traveling to the original repositories of the records and gaining access, if access were even possible. Maybe the attitude of the genealogists comes with the demographics. But still, I see genealogy programs and subscription services being put into an entirely different category than most other purchases. I am sure there are those genealogists who live on a very meager budget, but many of the people I see coming to my classes and attending conferences have the resources to access the records and buy the programs, but still have this strange attitude of entitlement. In the historical, social and cultural context of the event, what records could reasonably have been created that would provide information about my ancestor? This is really the first step in beginning a valid genealogical research project. Genealogical research (a kin to historical research) deals with historically created records. The core process involves locating pertinent records. As an interesting side note, in the process for become accredited by the International Commission for the Accreditation of Professional Genealogists (ICAPGEN), you have to show the following, "You should feel comfortable with your chosen area of specialization and have a good working knowledge of the records of that area. You must also have at least 1,000 hours of research experience in that geographical area." See the ICAPGEN website "The Application and the Four Generation Project. So the fundamental process of doing genealogical research involves identifying the records that may possibly be available. Therefore, genealogical research consists of two phases; discovering records and then searching those records for information about ancestral families. If we understand that this is what is involved in "doing genealogical research," then we will understand the need for the basic reference works and why they are valuable. In the United States the basic book is The Source. See Szucs, Loretto Dennis, and Sandra Hargreaves Luebking. The Source: A Guidebook to American Genealogy. Provo, UT: Ancestry, 2006. This edition has been put online by Ancestry.com an incorporated into the Ancestry.com Wiki. If simply identifying and locating source records were all genealogy was about, then life would be complicated but not too complicated. If the researcher is successful in identifying source records, that is only the beginning. Remember that these records could be anywhere, but most likely related to the location of the various events in your ancestor's life. For example, if the ancestor was born in Massachusetts and then moved to New York, records will be in both locations. This process can become extremely complicated when the records have moved to a state archive or even a regional one. The next step is the one requiring persistence; searching the records. But even after finding the records (sources or whatever you want to call them) and searching them for evidence of your ancestors, the real hard work comes from analyzing the information in the records until the records have been milked as dry as Mesa, Arizona concrete on a hot summer day. Most beginning researchers think that finding the record and copying out the information is all there is to the doing research. That is only the barest of beginnings. The research part is in the analysis. In every case, the records need to be looked at for consistency and accuracy. But even more, the records need to be placed within the greater context of the lives of the ancestors so that the researcher can determine the weight to give the information contained in the document. To summarize: genealogical research involves finding, searching, recording and analyzing records for information about your ancestors. Each step of the process is complex. As much as the purveyors of the Research Cycle diagrams would like it to be, it is not a linear process. No one can search records without connecting a variety of dots at the same time. Sometimes it is important to jump from one issue to another. But successful research comes from reasonably exhausting sources on one particular issue. In my experience, some research projects about the same issue can take years and years to complete and others are never ending. No conclusion in genealogy is every final. Every fact is always open to revision based on subsequent discoveries. Great genealogists are the ones who know where and how to find the information and then know what to do with it once it is found. Looks like the same cut-off icons and the rest of the information is missing also. I guess there is still some work to do on the changes. I notices the same truncation of the images on the other pages as well. It looks to me as if the only two programs connect directly to the big online database programs, one of them being MacFamilyTree. 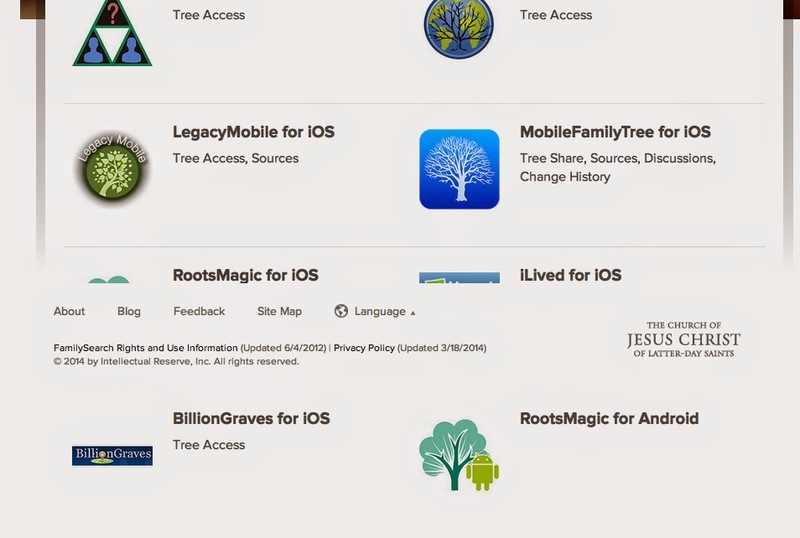 Ancestry.com also has an Mac OS X version of their Family Tree Maker program. On the other hand, it appears that there are 2 mobile apps for Android and 6 mobile apps for Apple's iOS operating system. It is strange that the genealogy software companies writing stand alone programs are so slow to take advantage of the Apple OS X market. Oh, by the way, you can find these Product pages by going to the very bottom of the startup page and clicking on the "About" link. Then click on the link to "Products." FamilySearch International (online at FamilySearch.org) announced today a new, free family photo and document scanning and preservation service for patrons in thousands of its North American family history centers. Patrons can now digitally preserve and share their precious printed historic family photos and documents using customized Lexmark multifunction products (MFPs). 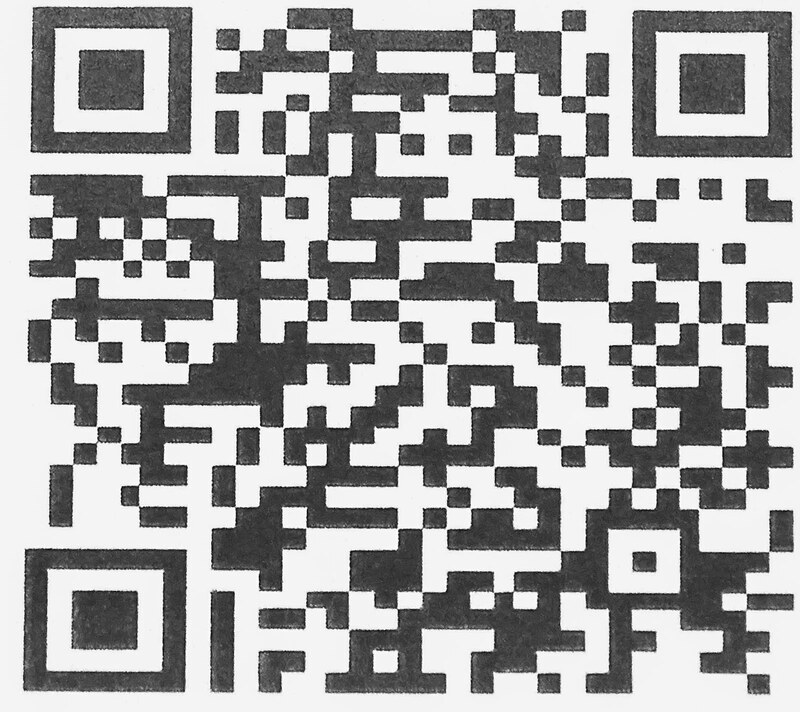 The blog post linked to above contains a summary of the instructions about how to go about scanning documents and photos. We have had the scanners at the Mesa FamilySearch Library for some time now and it is becoming increasingly common for patrons to come and sit and do their scanning. Of course, the volunteers and missionaries at the Library do not do your scanning for you, you must bring in your documents and do it yourself and copy the scanned images onto your own flashdrive. The only limit presently on the number of documents you can scan is your own endurance. Check with your nearest FamilySearch Center (Family History Center) to see if they have implemented this free service. Any posting over the next 22 days is likely to be very spotty if at all. We will be traveling to the Qualicum Beach Family History Society Conference on Vancouver Island, BC and then doing some touring afterwards. As I stated in an earlier post, Internet connections may be sporadic or non-existent. See you all when I get back. In Parts One and Two of this series, I have been discussing some of my thoughts on the definition of research and how genealogical research differs from both legal and scientific research. I have also opened a discussion of the difference between searching and research. In this installment, I would like to continue this discussion and elaborate on some of the unique issues that arise in the context of doing research in genealogy as opposed to other subjects. From a genealogical standpoint, there is a commonly used outline, sometimes illustrated in chart form, called the Research Cycle. There are several different iterations of the Cycle involving a different number of steps or stages. One rather complex list of steps can be seen in a FamilySearch.org Research Wiki article entitled "Restart the Research Cycle." There are, at least, a hundred additional articles in the Research Wiki on the same subject. There are several issues when considering all of these different interpretations of the process, especially with the terminology; the words "search" and "research" are sometimes used interchangeably and the word "research" is sometimes used to define itself. In other words you do research by searching and researching. This is not really helpful. It is also evident that the genealogical research cycle is modeled after the scientific method of observation, induction, deduction, testing and evaluation which I have previously argued does not apply to genealogy. What I am trying to do is get beyond circular reasoning and definitions and define genealogical research in a way that the definition reflects reality. What is it that seasoned or talented genealogists do to find the information they are seeking? Can we separate the theory of research from mere methodology? Is there someway to avoid brute strength searches or what I sometimes call "bulldozer searches" where we just keep going through records one-by-one until we find what we are looking for? Is genealogical research really nothing more than a semi-organized method of searching records? I think that research moves beyond searching and I am not sure that adhering to the so-called research cycle is the final explanation. That is the reason for this series. When did the event occur? Where did the even occur? Who or what entity had the jurisdiction to report the event? This is an extremely simple example and very obvious. But in many cases identifying the event is the only simple part of the sequence. In contrast, the first step in the traditional "Genealogical Research Cycle" is to "Identify What You Know." What is really meant by this statement is that you gather and organize the information readily available to you from your own personal records and documents. The irony of the statement is that the person to whom the injunction is directed doesn't know this information at all. For example, the budding researcher may not know the dates of birth etc. of his or her grandparents. But that information may be recorded on a document in the researchers possession if the person takes the time to look. I was once searching for my grandfather's military records and after a year or so of searching records, discovered is discharge papers in a pile of documents in box in my own home. The problem here is that I would not have recognized the need for searching for the document until I recognized the need for the information about his military history. I may have looked at the document several times, but until I needed the information, it meant nothing to me. This example illustrates one of the flaws in the way that research is defined by the Research Cycle. How do you know information is useful until you start looking for it? We all need to begin the process of research by addressing questions raised by missing information. For example, if I note that my own birth date is missing, then I can begin by looking at that fact as an objective. I may or may not find the answer by searching my own records, but where I search is dictated by the nature of the event not simply by what I happen to have available. Can we start research by merely going out and searching? That is what the Research Cycle implies. Now back to my example of the baby born in 1924. What if I ask the same question and change the date? So the question involves a baby born in Arizona in 1900. Just by changing the date, the answer to the question changes dramatically. 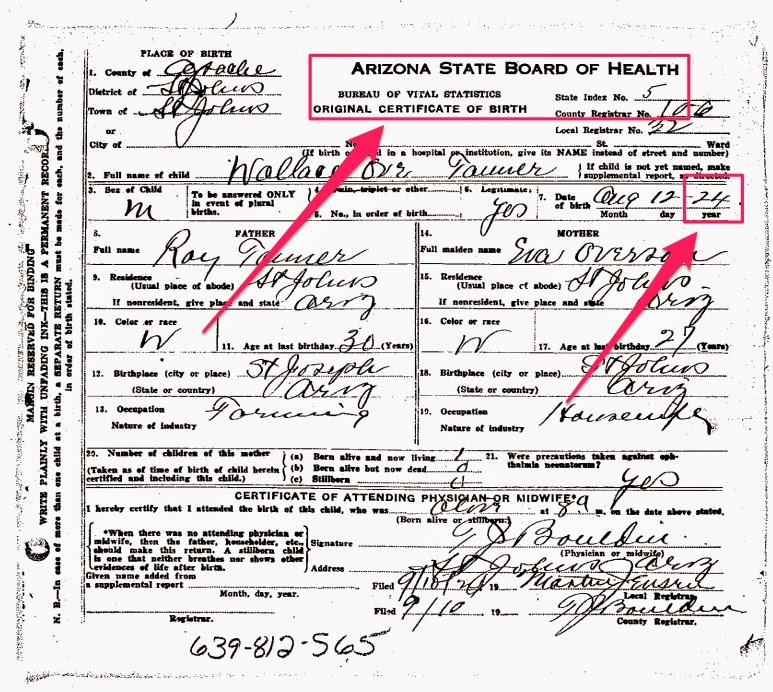 The Arizona Genealogy Birth and Death Certificates website purports to have birth records from 1855 to 1938. What is not clearly explained by this website is that statewide registration of births in Arizona did not begin until 1909 and was not generally applied until 1926. This points out the need to address the fourth question above about the entity and jurisdiction. In a wider sense, there is an inherent trap in sending people off to look at the records they already have recorded. In a real sense, this attitude is exactly what has created the tremendous proliferation of unsourced family trees, that is, copying and re-copying records. So one element of research is the ability to question the authenticity of any record, no matter how reliable it may seem to be. In its simplest form, just because Aunt Jane worked on genealogy all her life, does not mean that any of the information she recorded was correct. So there are two more issues involved in defining genealogical research: knowledge of the existence of records and the ability to discover inconsistencies and inaccuracies. So now we have something that is uniquely different between genealogy and the other types of research such as law and science. That is our searching process is confined to records that are inherently unreliable to some degree and the only way we can progress is to recognize that unreliability and think in terms of historical consistency. In order to determine historical consistency, we need to have a much wider view of the types of historical records we examine. Here we move into the issue of the reasonably exhaustive search specified by the Genealogical Proof Standard. There we have where we need to begin our research. The question of whether or not I personally have some of those records in my possession, really cannot be addressed until we know what types of records are important, otherwise, how do I know what records are important and which are not important. A side note, how many of us are aware of valuable documents that have been destroyed because the people in possession of the documents did not understand their importance in relationship to genealogical research? I have likely made this observation before, but it is good example of the issues involved in predicting the future. When I was a lot younger, I spent a great deal of time reading science fiction books. I started when I was about nine years old and by the time I was a teenager, had read nearly every book I could find in any of the libraries I had access to. It is interesting to me now to watch reviews of all the things that science fiction writers "got right." Well, there is one thing that they never did "get right" and that is the way computers have changed our way of communicating with each other. 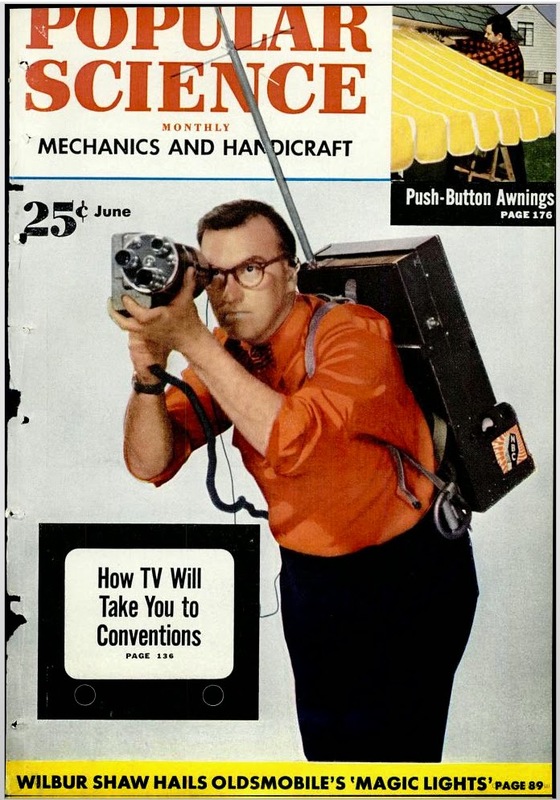 The entire concept of a hand-held computer is missing from the science fiction literature. Oh, before you start throwing Star Trek at me, I have also watched every single episode of the original Star Trek and Star Trek: The Next Generation, after that I lost interest. The Star Trek computer is not so much as an electronic device as a way to avoid certain plot issues. What is the point? Well, in our combined wisdom, we are mostly left in the dark as to what will happen in the future. Lightning does strike without warning and can cause serious consequences. (For example, see my daughter Amy's post today on "The Death of Willie Jarvis, 1881"). Notwithstanding the unpredictability of the future, it is always enticing to try and figure out what will happen. Predicting the future of genealogy is a special case. First, it is a very conservative pursuit and second, there isn't a whole lot about genealogy in particular to predict. Sure, the technology will continue to change, but the basic process of gathering information, analyzing it, recording it and moving forward will abide. Technology can only do so much. One example of the limitations of technology is the fact that as I go back in my ancestral lines, I find almost nothing online that is pertinent to the issues that arise. For example, in one line I reach my Great-great-grandfather, Samuel Linton. For years now, I have been searching for his birthplace. So far, none of the records I have found, online, offline or whatever, have recorded an accurate birthplace. All of the major online websites simply run out of records that apply to Northern Ireland during the time period in in the area where he was supposedly born. All of my computer skills, all of the technology available cannot help me answer what should be a rather simple problem. As I move to Provo, Utah, I hope to have greater access to the Family History Library. One of my goals is to resolve this particular issue. It seems that the more things change, the more they stay the same. I have been looking for this one piece of information for a long time. Perhaps I should just give up and move on. But that is one of the main attractions of genealogy, even though technology will change and even though records might become more available, these changes will not change the core activities of the genealogical research process. Back in 1966 and 1967, five Lunar Orbiter spacecraft were sent to the moon to survey potential landing sites for the manned Apollo missions. The data transmitted by the Lunar Orbiter spacecraft was almost lost through technical obsolescence. Twenty years after the initial project, NASA's Jet Propulsion Laboratory (JPL) had to make the decision to keep or scrap the tapes made from the transmissions of the Lunar Orbiter. The equipment and the tapes were saved but the AMPEX tape machines were left sitting in the garage of one of the JPL Archivists for another almost twenty years. Finally, in 2004, a project was started to recover the data from the tapes. The recovery project took until 2010. The story of the recovery is discussed in the above video interview and in a fascinating Wikipedia article on the Lunar Orbiter Image Recovery Project. There is also a website dedicated to the ongoing project, see MoonViews.com. As usual, there is an important genealogical lesson to be learned from this story of what is now being called "technoarchaeology." For me, it is somewhat unsettling to realize that events that took place while I was a married graduate student are now considered the basis of archaeology, technical or otherwise. The major challenge of the data recovery effort was reconstructing the machinery necessary to read the tapes made from the transmissions from space. But having battled my own technological obsolescence issues on several occasions, I can certainly relate to the experiences of these engineers in trying to recapture valuable data. As this example extensively illustrates, it is not enough simply to preserve a digital copy of your data, it is also important to migrate the date as new technology replaces the old. It is entirely possible that your hardware, i.e. computer, drives, storage devices etc., are woefully out of date. Are you sure, if something happened to your computer and hard drive that your data would be capable of being read by a newer, currently available, computer? Not only is there an issue with using old software, but the electronic devices themselves may also be impossible to reproduce. Technology runs in cycles lasting about three to five years. If your computer and associated equipment and the programs that it uses are older than this, you are well into the danger zone. If you have gone past eight to ten years, then you are facing a major data loss issue. It should have been a wake-up call when Microsoft announced that is would no longer be supporting Windows XP. Take a lesson from this dramatic story of technoarchaeology and start data migration today. I guess I should post something every day for a while. My wife and I are going on a real vacation. This time to Canada and Alaska. I understand from some preliminary research, that I may not have much of a connection to telephones or computers. So I may disappear on May 22nd and not reappear until sometime after June 12th. It is our 47th Wedding Anniversary, so it is about time we took a non-working vacation. If you feel the need, you can always go back and re-read some of the more complicated posts and make your appropriate comments. I will respond to all the comments once I get back online. The backlog of email and reader posts should keep me busy for a long time after we get back. Oh, by the way, when we do "get back" we will be making our nearly final move to Provo, Utah, just in time to have a reunion with most of our children and their families. Why not start your research with YouTube? So, you say, you can't be serious. But yes, I am serious. Once you cut through or ignore all the trash, you find that YouTube has evolved into the go-to place for answering almost any kind of "how to" question and that includes how-to questions about genealogy. My most recent search on Google's YouTube.com on the term "genealogy" came up with 91,200 videos (I always question round numbers, however). On the first page of that search were offerings by Lisa Louise Cooke, Devin Ashby, Ancestry.com, Kenneth R. Marks, Caroline Pointer and many others. Some of these videos had over 30,000 views. Yes, it is that simple. You go to YouTube.com and search for a topic of interest. Do you want to learn how to use FamiySearch.org? Ancestry.com or MyHeritage.com? They are all there with videos on their programs. In fact, a search on "genealogy FamilySearch" brings up 5,210 videos (there we go with round numbers again). The list could go on and on. By the way, YouTube is also a good reference place to find instructions on about anything else you can imagine in the Universe from opening a can to building your own house. Literally. They have everything you can imagine. One major caution. They do have everything and everything is not acceptable for viewing. Take some advice. Use common sense and discretion in your viewing. Search for specific topics and don't open your mind to the garbage truck. The Institute of Museum and Library Sciences of the University of California, Santa Barbara, has created an online digital library of old wax cylinder recordings from the early 1900s. This fabulous website, entitled the Cylinder Preservation and Digitization Project, has collected over 10,000 recordings with over 2,000 of them online. The website has over 2,000 of these early recordings available in MP3 files. They are also searching for more support for the project to fund the digitization of more cylinders. As the website notes, the earliest cylinders date from recordings made on tinfoil in 1877, the last of the cylinder recordings were on celluloid in 1929. The site contains a rather detailed history of recordings with links to other websites, such as the website, First Sounds, that has modern digitized examples of the very first attempts at recording sound from Édouard-Léon Scott de Martinville's Phonautograms made in 1860. In my years collecting documents and records from my family, I inherited a collection of sheet music collected by my Grandmother from the early 1900s. It may be possible that I can find some of these same songs in the recordings online. OK, so I hear the same complaint filtering back to me, what has this got to do with genealogy? If you have to ask the question, you missed the last comment of my post. If it is helpful to have a photograph of your ancestor, think how interesting it would be to have a recording. The people who made these early recordings had children and we are their descendants. I received the following notice in an email from Daniel Horowitz, Chief Genealogist and Translation Manager for MyHeritage.com. 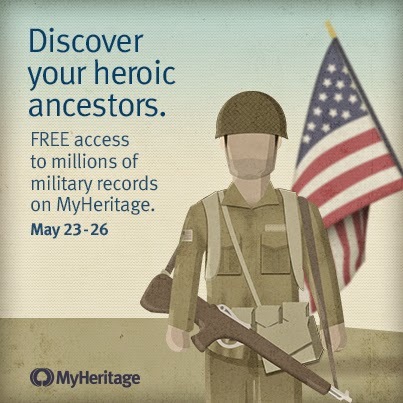 In honor of Memorial Day, MyHeritage is offering FREE access to millions of US military records, which will be available to search from May 23 to May 26. Military records are valuable resources that provide insight into the lives of those who have served in the armed forces, as well as their families. With these records, users can learn about their ancestors and honor their memory and service to their country. The link is already live, but the collections will be free starting on Friday, May 23. The records in MyHeritage.com include WWII Enlistment and Prisoners of War, Revolutionary War and Confederate Civil War Records and Historical U.S. Army and Air Force Registers, plus thousands of additional collections including Vietnam and Korean war records, army casualties and much more. Research is a very specific activity. It is more than mere searching. It involves a number of related skills. Although some people are better than others in their research skills, it is primarily a learned activity. The methods used to teach research skills in high schools are generally ineffective. They are really more anti-research than educational. There are no "learn research in ten days" courses because it takes quite an extended period of time to acquire the necessary understanding of the process and the skills necessary. Before getting into an analysis of the skills involved, I think it is important to distinguish between searching on the Internet and doing research. Searching online requires its own set of skills, but do not think because you are adept at searching on the Internet that it automatically makes you a good researcher. Research skills have existed for centuries and do not depend on electronic gadgetry. However, if you are a good researcher, you can enhance those skills by adding the ability to search online. Online research mainly accelerates the process by opening up the ability to search a wider range of sources in a shorter period of time. But speeding up the searching process and making more sources available does not automatically convert into improved research skills. In my previous post on this subject, I discussed some of the differences between legal, scientific and genealogical or historical research skills. In the genealogical community, there has been a consistent trend to overlay genealogical research with the terms and jargon used in both law and science. As I pointed out, there are fundamental differences between the objectives of the three disciplines. Attempts to apply the "scientific method" to genealogical research are misguided. Likewise, attempts to mold genealogical research into a legal model are also misguided. There is very little in common between these entirely different disciplines. If you are a lawyer, you might think it helpful to look at genealogy from a legal perspective. Likewise, if you have scientific background, you tend to emphasize the similarities between genealogical research methodology and the scientific method and begin to believe that genealogy can be done scientifically. In my opinion, neither law nor science have much to offer to genealogical research process even though they share some of the same specific skills. Why am I flying in the face of the huge body of genealogical writings analyzing research in terms of law or science? I have spent a lifetime analyzing how and why I do certain things. I have a strong legal background and a moderately strong scientific background. I have been involved in genealogical research now for over thirty years and I guess I have had a considerable period of time to get opinionated. One of the first steps in acquiring research skills is to learn to distinguish between theory and methodology. In theory, genealogical research involves the discovery and examination of a series of source documents with the intent of extracting a workable and consistent chronology of an ancestor's life. As documentary and historical evidence is accumulated, the ancestral story is refined. Traditionally, genealogists are viewed as focusing primarily on facts, such as dates, places and names, this may have been true for some researchers in the past, but recent trends have pushed genealogy towards including a larger and more inclusive view of the historical context of the complete ancestral story. Methodology is primarily a body of practices, procedures and rules set down, in the case of genealogy, partially by tradition and partially by proscription. An example of a procedure with its attached rules would be the process of recording sources and the accompanying practice of citation. It is the common tendency of those who deem themselves to be the "authorities" in any given pursuit, to attempt to impose their own methodology on the entire discipline. Hence, the proliferation of guides and standards. Those of a scientific bent would claim that the scientific method of postulating a hypothesis and then designing experiments to confirm, deny or modify that hypothesis (or theory) applies to genealogy. In fact, it is undeniable that every ancestor in everyone's pedigree existed. We all have two parents, four grandparents, etc. Until we have done the research into our ancestors' history, we cannot form any sort of hypothesis. The recent addition of DNA testing into the genealogical process has led some to believe that science can now take an active part in determining ancestral relationships. But the results of a DNA test even when compared to a huge body of the results of other tests, cannot identify an individual ancestor without the concomitant genealogical research. DNA is merely one more source of potential information and does not convert genealogy into a science. The problem with any discussion of this particular subject is that the terms are slippery. For example, I have used the term "theory" in two completely different ways so far in this post. In the scientific sense, a theory is a logical explanation of observed events or facts. The other use of the word is when I referred to the difference between theory and methodology. In that context, the theory of genealogy is the objective the pursuit is trying to achieve. In other words, the theory of genealogical pursuit is the objective the activity is designed to achieve, that is, the story of our ancestors' lives with as much detail as it is possible to discover. Each genealogical researcher designs his or her own objective. There is one more genealogical activity that needs to be identified, that is the analysis of the discovered sources. Science and law deal with prediction. A scientist observes that an object falls at a measurable rate and then extends that observation into a hypothesis that all bodies will fall at the same rate if the circumstances are the same. The scientist then goes on to make predictions about unobserved falling objects. This brief example illustrates the huge gulf between science and genealogy. A genealogist could observe all the living people in the world and that would still tell him or her very little or perhaps nothing about the history of their ancestors. If you were to observe me today, there is no way, short of doing genealogical research, that you would know that some of my ancestors came from Denmark. Aha, you now say. Here is where DNA comes in. But wait. DNA testing can tell me if I have a certain percentage of markers that may indicate Scandinavian blood and predictions are that sometime in the future with enough data, they may be able to tell me what part of any given country my ancestors came from. But nowhere does DNA testing tell me anything about my ancestors as living, breathing, historical figures. Again, overlaying a scientific source of information onto genealogy does not may it into a science. If we are going to fault genealogists for being interested in only "names and dates" then DNA is no help. It merely substitutes another form of specialized and limited data. It is time to move on to a more complete definition of genealogical research. Let's begin with the concept of a source. Genealogical research is, in part, the process of searching for and examining sources. So, unlike science and to some extent, law, genealogy is inseparably connected to its historical sources. Since the human memory is one of these sources, and since these sources are records created by humans, they are not infallible. Here we see the distinction between science and genealogy. If I am measuring a physical event, such as the freezing point of water, this experiment can be reproduced by any other researcher and the scientific method relies on the reproducibility of such experiments. In contrast, in genealogy, there is no reproducibility. If I find a specific reference to an event in my ancestor's life, that is unique. Although, if I reproduce the document, other researchers cannot go out and go through some fixed process to create the same kind of document. In addition, the document may not be accurate at all. I may have to find several documents in order to establish a reasonable basis for establishing a birth date or I may never find such documents. Think about this. What if a scientist was measuring the freezing temperature of water and the found that it changed every time the experiment was conducted (by the way this happens)? Anyone who wanted to explain the discrepancies could reproduce the same experiments and eventually, the issue of the changes in the freezing point of water would become explained (as they have been). But in genealogy, there may not be any further information about the birth of the ancestor. No amount of searching or discovery will ever answer the question. Why? Because genealogists are not working with physical reality, they are working with man-made records which may be both wrong and unique at the same time. Because this difference in the fundamental nature of genealogical searches is not obvious, unless a researchers has experience in more than one type of research including genealogical research, this type of difference will be overlooked. No matter how you look at it, genealogy is far from exact. There is no predictive power in the research. People do very unpredictable things. People live and die at odd times and in odd places. Permit me another contrast. When I do legal research, I always know what I am looking for, that is, I am looking for wording in a legal case that supports my client's view of a dispute. I may or may not find what I am looking for. I may find that my client is wrong. But the subject of the search is always the same. The results are always predictable and the number of cases is always finite. Historical records are entirely outside of this type of predictability. Was the record created? Who knows before a search is made. Was the record preserved? Again, who knows before the search is made. The answer may be written on a piece of paper and tucked away in a book or printed on a form from a school or church. Genealogy deals in generalities and possibilities. There is always the possibility that the subject of your search does not exist. In law, if no specific wording exists to support your client's position, you can create that wording yourself. When I was starting out as an attorney, I went to my father, who was also an attorney, with a legal issue I could not support by citing an existing case. After a short discussion, he asked me what I wanted to prove. I told him and he said then make your argument and then that will be the law on that subject. In other words, argue for a change or extension in the existing law. No matter how much we would like this to work in genealogy, it will not. I cannot make up a birth date and then argue that is it correct. I can only draw conclusions from existing documents. I could argue that the birth date had to fall within a particular range of dates, but nothing I do will change the fact that the specific information is lacking. In law, however, when my case is decided in my favor, my opinion becomes the law. Of course, that will only last until the law changes again. There is a real, substantial difference here. In genealogy, I may find a document that answers the question and proves me wrong. In law, even if some judge somewhere disagrees with my opinion, my opinion will still be the law until it is overturned. So the law can change from jurisdiction to jurisdiction. But if my ancestor was born on a specific date, that is not subject to differing opinions. It happened. The fact that there is uncertainty in law, science and genealogy does not make them the same. The next topic in this series deals with the concept of a search and how searching is expanded into research. The field covers all the processes and mechanisms by which computer-based equipment, information and services are protected from unintended or unauthorized access, change or destruction. Computer security also includes protection from unplanned events and natural disasters. A new study examining the claims made in 2011 byTravelers’ customers insured against identity fraud shows that stolen or misplaced items are still a major cause of these crimes. Of the roughly two-thirds able to pinpoint the source of their identity theft, stolen wallets and pocketbooks topped the list. About 7% of persons age 16 or older were victims of identity theft in 2012. The majority of identity theft incidents (85%) involved the fraudulent use of existing account information, such as credit card or bank account information. Victims who had personal information used to open a new account or for other fraudulent purposes were more likely than victims of existing account fraud to experience financial, credit, and relationship problems and severe emotional distress. Over half of identity theft victims who were able to resolve any associated problems did so in a day or less; among victims who had personal information used for fraudulent purposes, 29% spent a month or more resolving problems. Where does cyber security enter into this picture? What does any of this have to do with genealogy? Cyber security can include anything from complex multi-national computer security issues involving governments around the world to using individually secure pass words. But none of this has anything to do with putting a family tree online unless you are so ill-advised as to include personal information such as social security numbers. Most genealogists are already aware of the issues involved in sharing information about living people online. Banks and other financial institutions still use genealogically related data such as a mother's maiden name as security questions. But these types of ridiculous practices have nothing whatsoever to do with genealogy. The only way to totally avoid cyber security risks is to stay off of the Internet entirely and do not own a computer. Likewise, if you wanted to avoid being involved in a traffic accident, you could refuse to drive a car. But that would not keep someone from driving their car through the front of your house and not having a computer would not do anything at all to prevent security breaches in large online database companies. Meanwhile, worrying about cyber security loss is like worrying about bank robberies. They will happen but there is not a whole lot individual genealogists can do about them. How do you find online genealogy records? Why must you prove your genealogical case? Where do I begin with my genealogy?